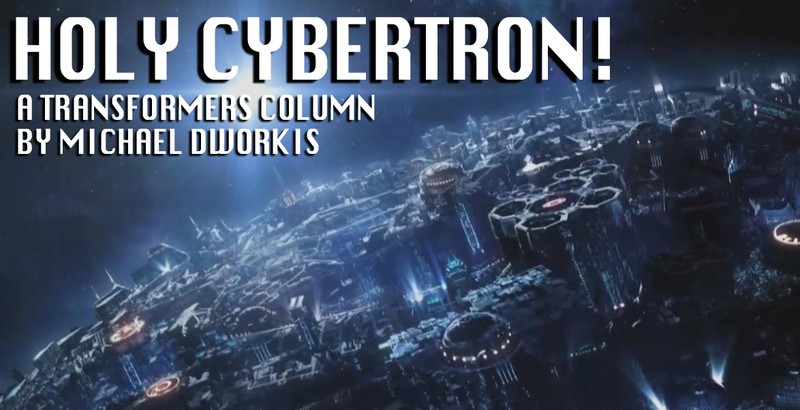 Holy Cybertron! : Machine Wars – What Were They Anyway? There are many series of TransFormers. Most popular and well-know are G1 (Generation One) and the Beast Wars. More modern series such as Transformers Prime and Generations have also become recognized in toys, comics, and most forms of distribution. But about some of the lesser known toylines? Beast Machines followed Beast Wars, but fanbase dropped and if not for a television show, it might have been forgotten. One series that nearly met that fate, due to the lack of a cartoon, or any form of media, was the Machine Wars. This series came out shortly after Beast Wars reinvigorated the Transformers franchise, after its Generation Two series abruptly ended due to low sales. As Beast Wars changed the aspect of Transformers into robots converting into a “Beast Mode,” the Machine Wars intended to bring back the aspect of Transforming robots into vehicles, but the overwhelming popularity of Beast Wars and no form of media distribution doomed the mechanical counterparts from the start. Only a toyline found exclusively in the now-defunct KB Toys, in 1997 the short-lived release saw popular named characters such as Optimus Prime, Megatron, Soundwave, and Starscream reconfigured into new designs previous unseen by American toy collectors. I specifically say American collectors, as the toys used for this line were actually released in Europe as part of their Generation One and/or Generation Two lines, but with completely different names as the molds were designed for completely different characters. For example, what eventually became Autobot leader Optimus Prime of the Machine Wars, was originally Autobot Thunderclash, team leader of the Turbomasters, a sub-group only released in Europe. The Decepticon Soundwave appeared in Machine Wars as a missile carrier, and his fellow soldier Starscream was a massive bomber jet. However, these toys were already used as Stalker and Skysquake in Europe, completely different colors and different characters altogether. Another character overseas, a blue helicopter named Rotorstorm, found release in the U.S. as part of Machine Wars, but completely re-colored in desert camouflage and named Sandstorm. Machine Wars lasted a year. If that long. It was a short-lived run, perhaps due to low-interest. There was no cartoon, no comic, no nothing. If not for the fact that KB Toys was known to carry exclusive Transformers, or forget that, KB Toys used to rival Toys R Us for stocking Transformer toys, no one may have ever discovered these at all. To my knowledge, these were only available at KB. Not even the popular Toys R Us had them. All these reasons alone are enough to demonstrate how a series of toys were destined to fail. Machine Wars, the original series only had six Autobots and six Decepticons. 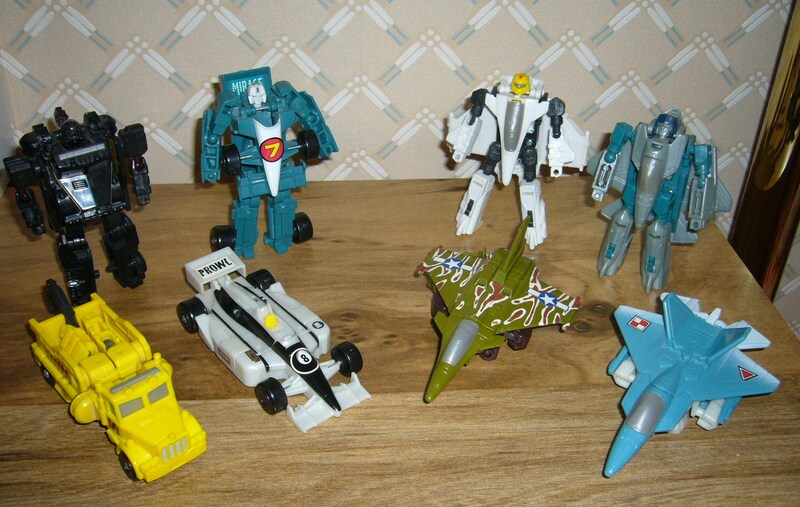 Shown below are the toys, minus Starscream. I got him still sealed in box, stored away. That is not coming out anytime soon. 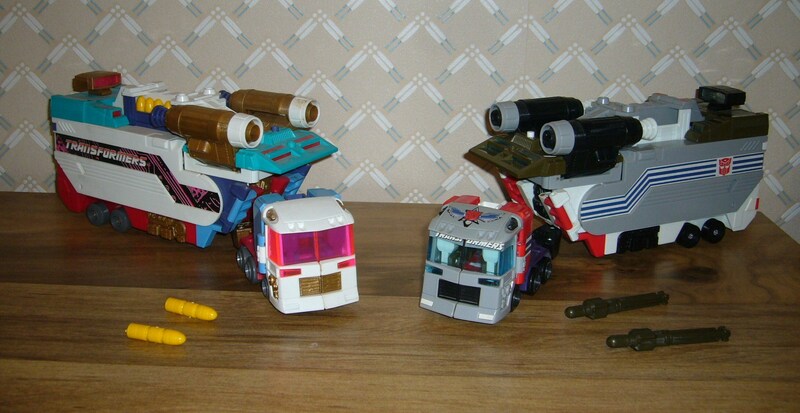 Shown below on the left is Autobot Thunderclash, only released in Europe. 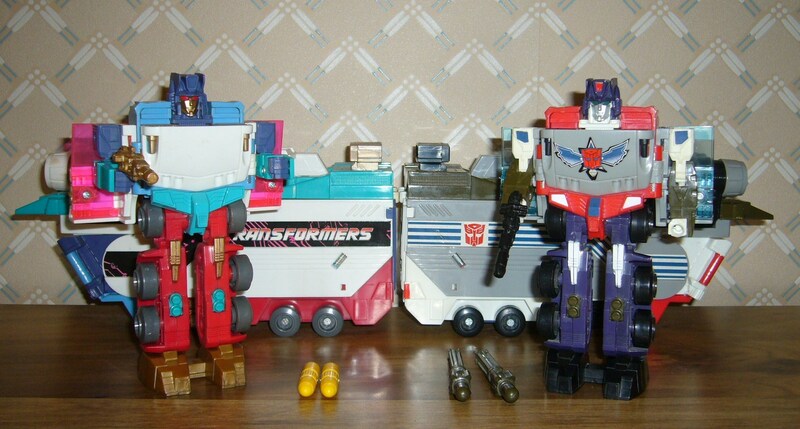 Next to him on the right, is Machine Wars Optimus Prime. There are a number of difference between the two. The Machine Wars Prime toy had to be tweaked somewhat to conform to safety standards. The missiles are much larger and there is a lot less gold plastic. Why less gold plastic? Over time, gold plastic will crack and crumble. Something about that type of plastic spells instant doom for action figures. Top Row, Robot Modes: Autobot Hoist, Autobot Mirage, Decepticon Skywarp, Decepticon Megaplex. Bottom row: Autobots Hubcap and Prowl, Decepticons Thundercracker and Megatron. Wait… Megatron, a dinky little jet? Yep. Basically, eight figures with four molds. The little gimmick is that you pull or flip something, and they auto-transform. These types of figures would pop-up throughout the next few series of Transformers, such as Universe and Takara’s Robotmasters series. 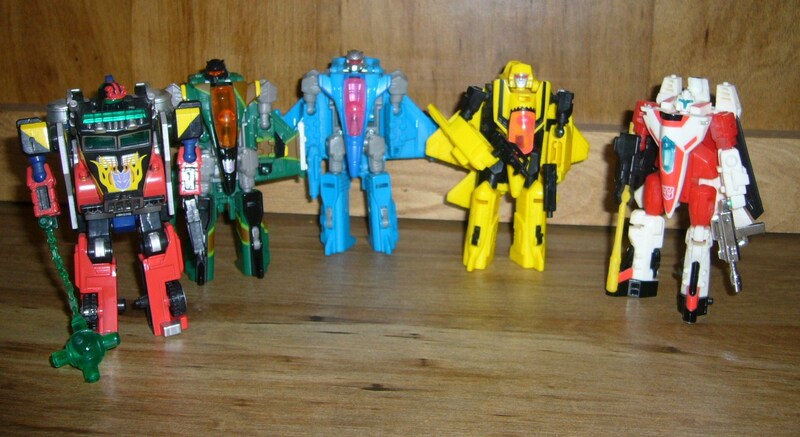 Shown below, from left to right are: Robotmasters Decepticons Wrecker Hook, and Wingstun, then Beast Wars II Decepticons Dirge and Thrust, and last but not least, Robotmasters Autobot R-Blade. So, aside from using toy molds never-before seen in the United States, what is so special about Machine Wars that the Transformers Collector’s Club decided to base the Botcon 2013 convention around this theme? Well, for starters the people behind Botcon always like to take a different approach and do something different that was in currently released in toy stores. It is certainly something different, and I am watching with interest as to how the TFCC will resurrect a long-and-almost-forgotten series. 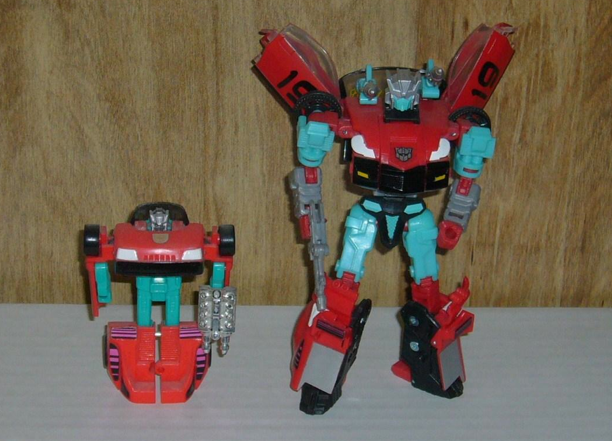 I highly doubt we will see the original toy molds, but we will see new, re-imagined versions of these characters as the TFCC often do with their convention sets. Their G2-Redux set from 2010 updated characters into modern toy molds from the Classics and Universe series. I anticipate Botcon will feature the same this year. 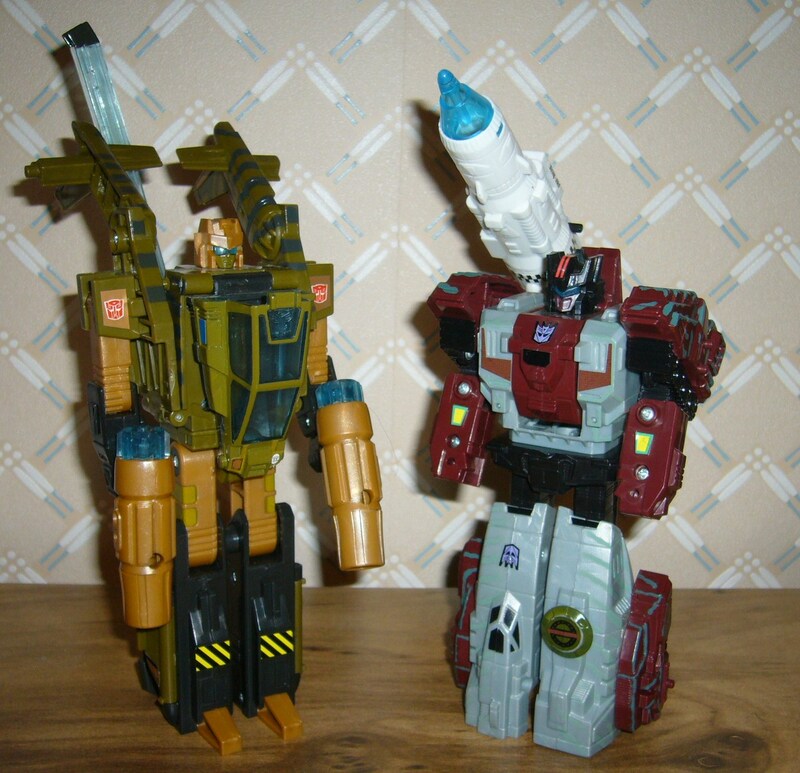 Shown here on the left is Generation Two Rapido (1992) and the big guy next to him is the TFCC Botcon “updated” or “modern” version of Rapido from the Botcon 2010 G2-themed convention.